Bringing science to life, one of the iconic monuments in Brussels, is the Atomium which is a construction of a crystallized molecule of iron magnified, a whopping, 150 thousand million times over its actual size. The Atomium was originally constructed as part of the 1958 World’s Fair, but has since become a symbol for the entire city. Escalators carry visitors to various spheres and the upper sphere also has enclosed a restaurant. Right next to the Atomium is Mini-Europe Park, which features miniature replicas of some of the most famous structures on the continent. 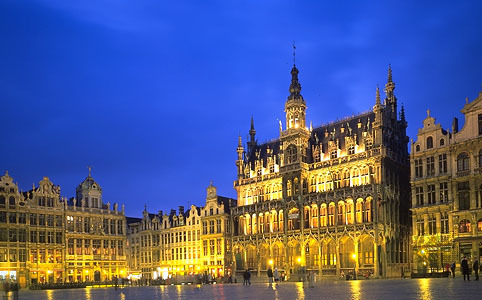 As with many of the older towns of Europe, Brussels offers many wonderful diversions. The most fantastic site of the old town is the Grand Palace, which is both a palace and a 13th century merchants square. From that landmark it is easy to tour the gothic town hall and wander the surrounding cobble stone streets. Be sure to stroll through the Galleries St Hubert which is a glass roofed shopping arcade of cafes, theatres and luxury good shops. Also found in the old part of town are the Royal Palace of Brussels and the Cathedral of St. Michael and St. Gudula, both of which are reason enough the visit beautiful city Brussels. First go to the chocolate museum, to get an understanding of how Belgian chocolate is made, then visit some of the cities storied chocolate shops. Wittamar, which has been in business since 1910, supplies chocolate to the Belgian court. Also be sure to sample the wares of Pierre Marcolini who though newer is renowned for creating mouth watering goods. Those who are not in the mood for chocolate might want to try the Brussels waffle, which is known as the Belgian waffle outside of the country. Brussels is home to the massive EU complex, the seat of European power. Audio tours are available for parts of the EU buildings. Check scheduling for the EU and perhaps take in a sitting of the European parliament. While you are spending time in Brussels be sure to go to any one of the multiplicity of different bars offering varied Belgian beers. With more micro breweries than anywhere else in the world this is a bar that has many a varied beer to try some of which infamously go up to 13% alcohol percentage. While in Brussels also check out the iconic Cantillon brewery.